"Hairband" redirects here. For the "hair metal" genre use of "hair bands", see Glam metal. For other uses, see Headband (disambiguation). Headbands are a clothing accessory worn in the hair or around the forehead, usually to hold hair away from the face or eyes. Headbands generally consist of a loop of elastic material or a horseshoe-shaped piece of flexible plastic or metal. They come in assorted shapes and sizes and are used for both fashion and practical/utilitarian purposes. In the UK, Horseshoe-shaped headbands are sometimes called "Alice bands" after the headbands that Alice is often depicted wearing in Through the Looking-Glass. Tartessian gold headband from the Iron Age. The beginning of headbands started no later than the ancient Greeks, around 475 BC to 330 BC, who wore hair wreaths. The Greeks and Romans wore these pieces for very special occasions or an important event. Cultures such as the Etruscans and Romans started to decorate their wreaths with jewels made up of gold and silver. While wreaths are certainly a likely beginning of today's headbands, some believe that current day hair bands have slowly taken shape from scarves that were worn around the head or were modified from the band of hats that tied under the chin. In the ancient times, Jews originally wore headbands, besides turbans, and keffiyehs as their traditional clothing. In modern times, these Jewish fashions are only worn by Mizrahi Jews. Generally, male Sikhs of the Khalsa branch must wear a turban, but a branch of the Khalsas called Mona Sikhs are free to wear headbands instead to prevent sweat from dripping into their eyes from their hair, especially when their hair is long, choosing to wear turbans only when attending a religious ceremony. Another Sikh group, the Sahajdharis, the most liberal of all Sikhs, also choose to dress in this way. In the early 20th century, wide headbands known as headache bands were very popular accessories in women's fashion. Their name, of course, results from the belief that the tight pressure they provided around the forehead could relieve or prevent headaches. The French called such a garment a bandeau (bandeaux, plural). In the 1910s, headache bands would likely have been more lacy in design—a crochet central panel decorated with ribbons and rosettes and bordered with lace, for example. Examples from the 1920s and 1930s are more apt to be dramatic sheaths in exotic fabrics and decorated with feathers, and would have been worn with fashions by couturiers such as Paul Poiret. These sorts of headache bands probably achieved their peak of popularity in the 1920s. Today, items called headache bands are apt to be strictly utilitarian and medical in focus. During the same period, jewelled headache bands or headbands, often in precious metals and precious gems were popular. During the 1950s and 1960s, many glamorous young women in Britain and the US wore plastic headbands with the beehive hairstyle, or silk veils when driving. At the same time, working class women wrapped strips of cloth around their hair as protection from the industrial smog and dirty rain. After the Summer of Love of 1967, hippies wore tie dye and paisley bandanas as headbands in imitation of Leftist activists and guerrillas. These were also worn by many hard rock and heavy metal guitarists such as Jimi Hendrix, Keith Richards, Ted Nugent, Bruce Springsteen, or Link Wray during the early and mid 70s to keep cool on stage. 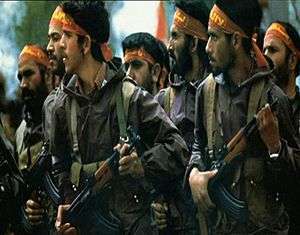 Iranian Pasdaran fighters typically wore headbands featuring religious writings during Iran-Iraq war. Deely boppers were a fad in 1982. Princess Diana famously wore an emerald and diamond choker as a headband in Melbourne on the occasion of a state tour of Australia in 1985. Flag of Corsica shows a man wearing a headband. In Japanese culture, hachimaki headbands may symbolise determination or devotion. Traditionally in Korea, warriors and members of military organizations such as the hwarang wore specialized headbands that kept hair firmly in place. Practically, these headbands served to clear any obstruction to the eyes so as to not hinder the soldier in combat. Emblematically, the headbands served to symbolize strength of loyalty and submission to the state. Contemporary Korean high school students, particularly male students, are often portrayed donning headbands in preparation for the rigorous college entrance examinations. Students commonly write encouraging or inspiring phrases on these headbands, such as "do or die!". This practice has been largely popularized by the media. 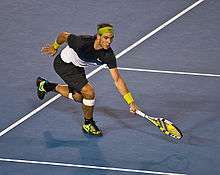 Rafael Nadal wearing green head band during a tennis match. There are many materials used for headbands such as wood, leather, plastic, metal, fabric, hemp, teeth, human and animal hair, bone, and novelty materials. The leather headbands are usually glued onto a harder plastic headband, or they are hand-stitched. Plastic headbands, which are most common, can be wavy, straight or angled and come in many colours. Metal can be used to form and support leather headbands. Metal-only headbands may be plain or decorated, sometimes with precious jewels. Fabric headbands are comfortable because they do not dig into the head. They usually have an elastic band, so that the headband forms to the head. Toothed headbands have comb-like teeth that are connected to the top part of the headband. Their teeth ensure that the hair stays in place. Novelty headbands can be used for holidays and may have decorations attached such as bunny ears, reindeer ears, Santa Claus hats and others. Headbands are often part of a larger fashion statement — they can be colour-coded and matched accordingly to one's outfit. "Sweatband" redirects here. For the Bootsy Collins album, see Sweat Band. For the component of a hat, see Sweatband (hat). Headbands, or sweatbands, are worn around the forehead during physical activity to absorb sweat and keep it from reaching the eyes. Sweatbands are often made of a continuous loop of terrycloth, as it is a particularly absorbent fabric. Folded bandanas, usually knotted behind the head, also serve this purpose. Headbands are usually used for sports but have not been popular since the late 1970s or early 1980s. LeBron James is one of the most notable players who wears a headband during basketball games. Headbands are also used for protection from cold and windy weather. These headbands are sometimes called earbands, which are made from a broad strip of heavy fabric, and have a contoured shape designed to fit over the ears, forehead, and neckline. Compared to winter hats, headbands have the advantages of providing warmth to exposed skin with minimal interference with the wearer's hairdo, allowing heat buildup formed by heavy exercise to vent through the top of the head, and requiring less storage space when not being worn. This type of headband is often used by skiers snowboarders, runners, and workers who spend time in the cold weather. Headbands are also available to prevent water from entering a person's ears while swimming. These headbands are thin, made of neoprene, and fit the head very tightly. These headbands are useful for swimmers who need to protect themselves from swimmer's ear, but find traditional earplugs or ear putty uncomfortable. Padded headbands are also available as protective equipment. They are used widely in soccer, and were recently made mandatory for girls' lacrosse in Florida. Wikimedia Commons has media related to Headbands. ↑ "Fancy headache band, early 20th century". Retrieved 27 January 2012. ↑ "A Headband By Any Other Name". July 7, 2011. Retrieved 27 January 2012. ↑ "A Feather in Your Cap: How Women Wore Their Hats, from Marie Antoinette to WWII". March 16, 2010. Retrieved 27 January 2012. ↑ "Princess Diana in Australia, 1985, A Look Back at Princess Diana's Jewelry". Retrieved 27 January 2012.